No one said selling to C-level executives would be easy.And the reason you want to get a meeting with C-level executives is because they have influence and because they have decision making power and because they have budgets. Beyond that, a relationship with the C-Suite signals to everyone within your clients’ organisation that who you are and what you do are important. Let’s look at the buying cycle. The C-level typically get involved at the beginning when the scope is being established and the decision to go to market or look for a new supplier is made. They disappear until a supplier is appointed and the deal implemented. In between they delegate to their direct reports to manage the buying process and supplier relationships. And so they should, they’re busy people. However, if you’re an Account Manager looking after an existing client and deal with a single point of contact, the chances of you meeting with the C-Suite are slim. There’s no need to be afraid or intimidated by their title. C-level executives are just like you and me. They have a job to do and anyone that can help them do that job has an opportunity to get in front of them. You’re an existing partner, you’re a subject matter expert and you know your industry and your solution. The C-suite are short on time, don’t know your industry and don’t know your solution. If you can fast track their understanding and get them some meaningful insights that will make an impact then you will have no trouble securing a C-level meeting. In fact, if you can show them a way to improve the bottom line and position it in a compelling way, the C-suite will be calling you! It doesn’t matter if you’re a small company or the world’s largest. Whether you’re a startup or Amazon. If you’re a small company, it’s in the C-suite’s interest to help you if you’re already a supplier. They benefit if you grow – because a) you’ll survive (it’s a jungle out there) and b) as you grow you’ll develop and enhance your solution. If you’re already a large company then you may reward them with reciprocal agreements, referrals to your clients, or showcase their business and their teams at conferences, conduct white papers and offer them other opportunities. Now granted, a smaller company may need to fight a little harder for attention but I’m about to share a simple three step process that will get you that meeting with the C-level executive regardless of the size of your business. The foundation is research. There’s no shortcuts here. You really need to understand your client, their industry and the C-level executive you want to meet with. Understand what’s important to them, the challenges they face and how you can align your solution to solve those problems. Otherwise anything you pitch at that C-level meeting will be pray and spray. Make absolutely certain when you get in front of them, you know everything you need to know and are completely credible so you can position your value in a way that’s going to get them excited. You’re not going to meet with each and every C-level executive. It will be dependent on your solution and who makes the buying decisions within your clients’ organisation. 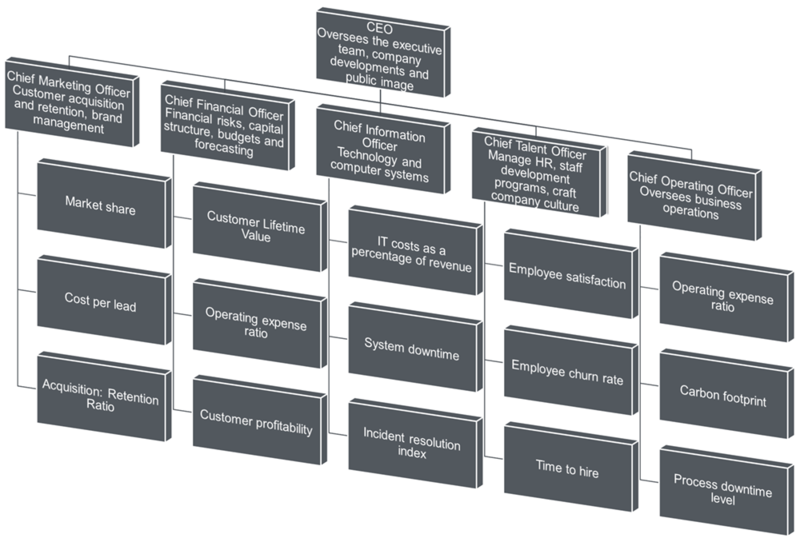 Here’s some of the more well known C-level executive roles and responsibilities that go with the title. There’s 50+ more so do some homework and think about those that are relevant. The more you know about what the C-Suite do, the more you will understand them. Ask your main point of contact for a copy of their org chart. This will give you not only the C-Suite but their direct reports. This will be useful later when you want to leverage your networks to get a meeting. Your point of contact will ask why you want it. Be prepared with an answer for that question. Set up time in your diary to regularly engage with LinkedIn posts of the C-level executive and client you’re targeting. Leave thoughtful comments that contribute to the conversation. But don’t over do it. Be authentic. Engage and interact on the stories that interest you. Not every single one. Are they sharing content regularly? Are there patterns or themes in the content that will give you some clues into what is important to them? Regularly summarise your observations on your clients’ business and the people who you want to grow stronger relationships with. Things will change over time so I suggest you add these notes to your CRM. There’s a lot of great places to do research. One of my favourites is Twitter and consider following my Business Trends Twitter List where you can easily find tweets from all the major consultancy firms and journals. This will really help you with your industry knowledge and staying on top of emerging trends. Why do you want to connect with the C-suite and more importantly, why would they want to see you? What is the objective? You need to have something compelling beyond merely a relationship. What do you want to achieve and how will it excite the C-level executives you want to get in front of? What are the KPI’s the C-level executive is measured by? What are their challenges in achieving those KPI’s? How have they performed to date? How can your solution solve for that challenge? What kind of results can they expect to see if they implement your solution? Generate revenue – self-explanatory – your solution will help them make more money – new sales, improve gross margin etc. Capture all of this along with with any related action steps in your strategic planning process. Create an elevator pitch from your plan and practice it. Try it out in front of your boss, colleagues and your main point of contact. The more practice, the more confident you’ll be when it’s time to meet with the C-suite. I’ve read as many as 85% of C-level executives will accept a meeting if the recommendation comes from a colleague. So the odds of getting in front of the C-Suite are way better if someone from the inside the company will introduce you. That person is likely to be your main point of contact. In an ideal world they will also be your sponsor and help you get in front of your target C-level executives. Because they can bask in your reflected glory. If your solution will make the C-Suite look good, your main point of contact will also look good for introducing you to them. You may find you main point of contact isn’t convinced, or is to scared or bored to bother the C-level executives you want to meet with. There are plenty of ways around this (remember that org chart?) including going straight to the source. Obviously respect the relationship but if your point of contact is proving to be an obstacle, don’t be afraid to connect with and leverage other people within your clients’ organisation for that introduction. The secret to getting a referral is to make it so easy for them it’s impossible to say “No”. You’ve got your elevator pitch which speaks to the C-level executive, their KPI’s and challenges and importantly, how your solution solves them and the return on investment. Create a draft email for your point of contact to send on your behalf with some relevant attachments of your initial scope of the opportunity. Create a one-page slide, infographic or chart that can be embedded in an email. Not to wordy – it should be visual. Volunteer to make send the email direct if they simply send a brief note to the C-level saying they’ve discussed an opportunity with you and asked you to reach out to them directly. Keep it brief – ask for only 15 to 30 minutes. Take advantage of any time you’re in the building for other reasons. For example, my quarterly reviews are often 90 minutes to 2 hours long so I’ll let the C-level executive know I’ll be on site and frame the meeting more like a drop-in. Pick up the phone. If they don’t answer, leave a voicemail mentioning who you are, and that you recently met with your point of contact about an opportunity for your solution to have a positive impact on [insert target KPI] and would like to find some time to connect and discuss. You’re probably bursting with excitement and can’t wait for that meeting with the C-level but do remember they’re busy people and their calendars are jam-packed. I recommend you position your meeting with lots of notice – around 6 to 8 weeks. If they’re available sooner, then take advantage of the opportunity. While you’re waiting, continue to engage with their content on LinkedIn, send the occasional email with some useful information and continue to demonstrate your value. That way even if your meeting gets cancelled you’ve made a good impression and it’ll have a better chance of being rescheduled. Here’s a great framework for structuring your initial meeting with C-level executives that I’ve adapted from Dr Steve Bistritz. Your first meeting with C-level executives is about connecting, building rapport, exploring the opportunity, gaining permission to pursue it. No PowerPoint. Just you, the C-level and pen and paper or if you can get one, a whiteboard. When you wrap up make it very clear what the next steps are and the actions you’ll take and secure that commitment for a follow up meeting. Save the presentation for the next meeting. Remember the C-suite want to meet you. You just have to help them realise it. Follow these steps and you’ll be on your way to your next C-level meeting in no time. Meeting with C-level executives involves research. Lots of it. They’ll expect you to already know the answers, so you must learn who they are, what they do, how their measured and their challenges and pain points. Expand your research to include your client and their industry. When you understand this, you’ll be in a great place to know exactly how your solution can help them. Leverage your existing networks to get an introduction to the C-suite. Make it easy for your point of contact by sending them everything they need. Keep your initial meeting with C-level executives brief and conversational. It’s more important to ask questions to validate your theories and gain agreement to pursue in more detail and to hold a follow up meeting.